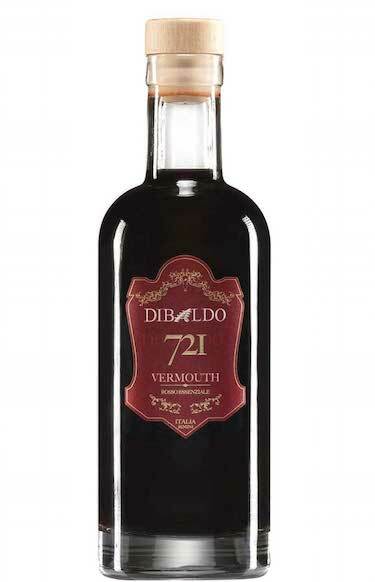 The top note of 721 Red Vermouth is an unmistakable sweet, wrapping rose, surprising for its sharpness. Immediately intense, 721’s perfume develops its heart notes evoking berries and selected absinthes’ scents. The base notes, deeper and more persistent, come as an arches’ crescendo, carrying continental bark spices, vanilla and pastry notes ending with soft tannis, acacia honey and violet. On the palate manifests as a vermouth “off the tracks”, full of ripe red fruits’ pulp with clear notes of wild cherry, raspberry and blue raspberry, red grapes and final notes of myrtle. Rich in sweetness and flavourness, goes on sharpening its taste in a thin botanicals’ bouquet, with a dry ending, cleaned in a cocoa bean, vanille, apricot and gentle pepper. With its shiny shades, 721 Red Vermouth owes its vivid red cherry colour to the fantastic blend of Sangiovese and Cabernet-Sauvignon employed in the infusion process. DiBALDO does not use chemical addictive, neither artificial dye, caramel or burnt sugar.